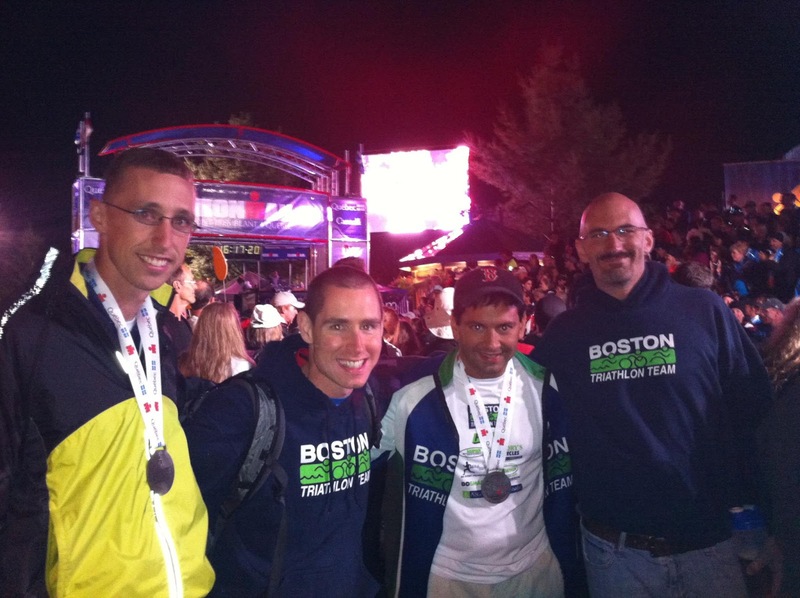 A bunch of us traveled up to Mont Tremblant, Quebec, for their inaugural Ironman (only the second IM race in Canada)! When registration opened last year, we actively recruited among BTT and friends to gather a group to head north for this new IM. A group of us visited Mont Tremblant over the Fourth of July (and Canada Day) to check out the course and see what we were in for. This exploratory trip was well worth it, as it allowed us to have a preview of the bike and run routes, which makes race day much less surprising. For race week, we rented a house up on the hill behind transition. This was home for 12 of us (7 IM racers, 5 SOs). A couple other BTTers were up for the race too but staying with other family and friends, yet they still had time to hang out with us and prep for the big day. Several other friends were also up in Mont Tremblant to race (FoBTT, QT2ers, and Minuteman swimmers). It was a busy weekend with a lot of familiar faces all around town from registration to the taper swim to the final couple bike rides. At our registration, the lines were really quick and the whole process only took about five minutes! Plus we got some cool swag including a super nice backpack, an IM Mont Tremblant license plate frame, and a baseball cap. 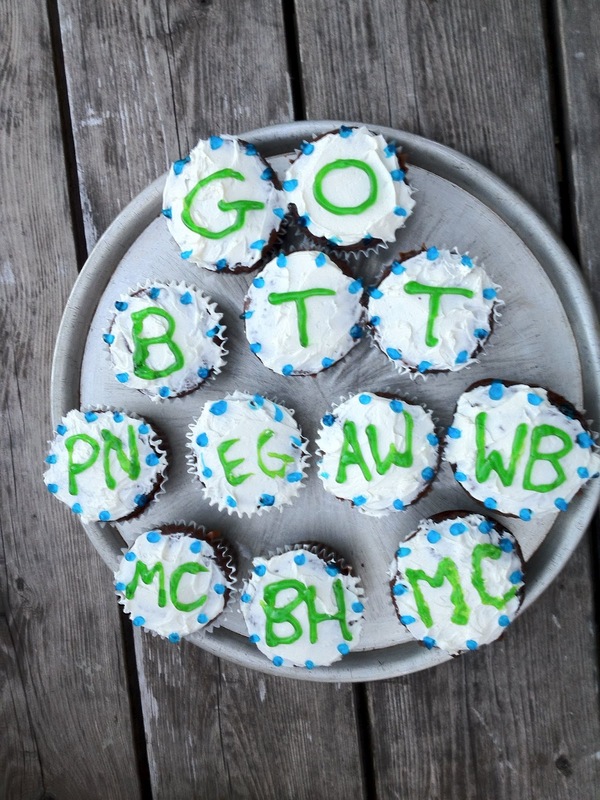 All our training over the previous year came together this past weekend as nine BTTers raced the first IMMT! The resort community really knows how to organize a great event! The kickoff dinner opened with a local performance troupe of drummers opening things with a bang! They also had an appearance by Pierre Lavoie, who's a Canadian national celebrity (former age grouper ironman champ) who has been very prominent in getting Canadian children into physical activity. After the dinner, they had a band performing and a fireworks show (you'll have to ask Ed...I was trying to stay off my feet). Friday afternoon and Saturday morning were all about the carbo load! For the big breakfast I joined my fellow QT2 coachees at Hotel Mont Tremblant in the old village. We definitely consumed more pancakes, french toast, eggs, and potatoes than a normal person would imagine is possible. Back at the BTT residence, there was a lot of eating going on throughout the day! Newman takes the prize for the always having a pretzel in hand! Fast forward to Sunday morning, and I woke up ten minutes before my alarm (my first alarm was set for 3:30am and my second alarm was set for 3:31am). I hop out of bed and start on my QT2 race day fueling plan, which starts off with a boat load of applesauce! A couple hours later, a few of the housemates who were not racing dropped us off near transition (we were VERY thankful!!) and the adrenaline started pumping! Transition closed early since we had to walk a bit down the street to get to the swim start (air temperature was about 47 degrees). The swim was a one loop swim in pristine water in Lac Tremblant Nord with an out-of-the-water mass start! To kick the race off, for the pros at 6:50 and again for the age groupers at 7:00, they had both a large canon (not a small starter canon) and a flyover by a military fighter jet!! Then off we went! GO TIME!! The water temperature was perfect competition temperature, even a bit chilly at times in a full wet suit! The swim was very physical the entire time. My swim was definitely a bit cautious (I wanted to take it easy after inhaling some water during the IM Germany swim last year). I finished the swim in 1:25:33, which was a bit slower than my PR in IMLP in 2010 (1:08:56 swim). I felt strong coming out of the water. I had a good solid run back to transition (a first). The bike is a really nice course. The course follows the same route twice. In each loop, there are three out-and-back segments -- the first one is an out-and-back on Route 117 (very fast, open, rolling hills), the second one is a really short, mostly flat, out-and-back into the village of Saint Jovite, and finally there's an out-and-back along Chemin Duplessis, which is the big climbing segment (some steep climbs, but they're short and you have a chance to recover). The weather all day never really got above about 70 degrees, so it was ideal for racing! I just focused on keeping my hear rate and power in my target zone on the bike. Next up the run!! Just a little marathon to go! The marathon conditions were just about ideal! Cool weather, partly overcast, a passing five minute shower, and a mostly flat run course that was largely on a crushed stone bike path! The run route is essentially one long out-and-back with a quick side spur (also out-and-back) on the way home. This meant lots of opportunities to see teammates and cheer them on (and to size up how far ahead or behind you are). My goal was to have a nice steady low-to-mid z1 run for the first loop and then aim for high z1 to low z2 for the second loop. I managed to stay on my pacing the whole race, but the first presented some GI distress that forced a couple stops in the big blue boxes. Luckily, I was able to get my innards settled down during the first loop and pick it up a bit on the second loop. Right after I crossed the line, I saw Will, who had finished just two spots in front of me! After I finished, I was standing in the food line, and, about 10 minutes after crossing the line, it started to downpour and thunder! I felt so bad for the BTTers and friends who were still out on the course! The rain didn't let up for an hour! There were some awe inspiring performances out there from Austin's Kona-qualifying race, to Mike and Kayle's first Ironman finishes, Ed's huge PR, and great performances from Paul, Will, Elaine, and Brendan. Later that evening, a small group of us headed back down to transition to watch the last hour of finishers come in before midnight! The ski village and the finisher chute were packed and dance party lights were flashing! It was inspiring to see the determination on these ironmen and women who had been out there for a very long day! At midnight, they had a small fireworks show to celebrate the close of the ironman! They even kept the lights and music going for one guy who didn't quite make the cutoff finishing at 12:05, and Mike Reilly got the whole crowd to say "you are an ironman" to him!! Monday after the race we went to the awards banquet to cheer on Austin. The food was great! My favorite part was the caribou stew! This race was in incredible experience!! The two highlights of the race for me were the incredible organization that the IMMT team put into this race, and even more importantly, spending most of a week hanging out with some amazing friends!